Summary: Dimple Shah is about to go to Stanford, to study web development. However, if you ask her mother, she's going to either find an Indian husband, or at least to make herself more marriageable. Dimple just wants to get away from the traditional expectations and the pressure, to achieve her dreams and make something of herself. So when the opportunity to go to an app development conference comes up, she goes for it. Little does she know that her future husband (as arranged by their parents) is going to be there as well. Ever the good, dutiful son, Rishi Patel decides to attend the conference as well, in hopes of winning over his future wife. The problem is... Dimple has NO idea who he is. She has no idea about ANY of this. Thoughts: Oh gosh, this book was so sweet, it gave me a toothache :) It is absolutely adorable. If you are in the mood for a totally happy, cute, fluffy love story about fate and family and following your passion, with a healthy dose of cultural appreciation and sexism in tech, then this is one you should add to your list. 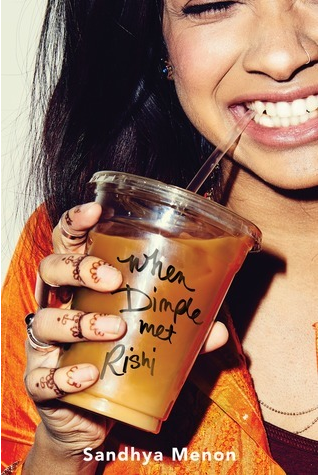 Aside from the main story about Dimple and Rishi falling in love, what I found really fascinating about this story was the juxtaposition of the "Aberzombies," as they are referred to in the book: a trio of rich, preppy, cliquey kids who are kind of awful to Dimple and Rishi. There are two white kids (a guy and a girl) and an Indian guy named Hari, but who chooses to have his name pronounced like "Harry" and seems to epitomize American assimilation/internalized racism. They present an interesting extreme, and though Hari specifically is meant to serve as a foil to Rishi (especially in terms of how they leverage their wealth in the story), I think it's even more interesting to consider him in relation to Dimple, who is constantly trying to get away from her traditional background and who talks about feeling like an outsider no matter which culture she turns to.